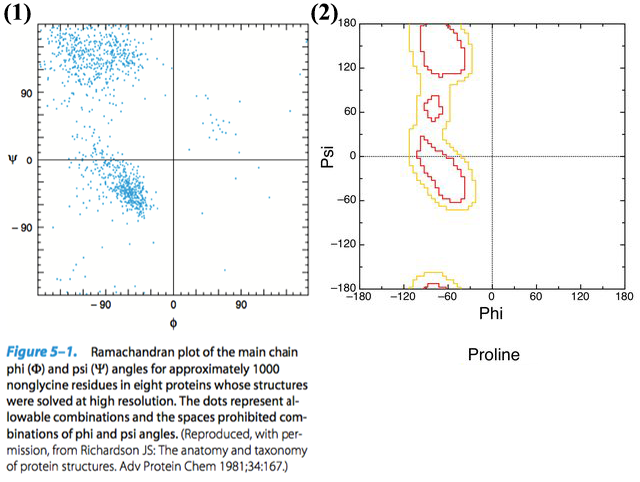 I understand the nomenclature of the phi and the psi angles of the alpha-Carbon atoms in protein stucture, but I am confused by the Ramachandran plot. Each alpha-Carbon atom (magenta) makes two peptide linkages and has two corresponding neighbouring alpha-Carbons (cyan) and side-chains. I would expect the psi and phi values to depend on the interactions of these side-chains, so I would expect that for a single amino acid one would need a separate graph for every possible combination of neighbouring amino acids. I am not clear whether this the case. The following graph (1) from Harper, Biochemistry, is for “many non-glycine residues from many proteins”. So, suppose a set of phi and psi is allowed for a right-handed helix (a value or data set taken from the plot) does it mean that it is allowed for any amino acid with any other amino acid? I woud expect an alanine adacent to an alanine to have a different interaction to an alanine adjacent to a bulky amino acid such as isoleucine. I have also seen plots for specific amino acid and their allowed angles, such as that for proline (2), above. This suggests that the neighbours are not being taken into account. If this is so, why not? The phi and psi dihedrals describe the dihedral on both sides of the c-alpha of a single amino acid, and do not involve any angles of the neighboring amino acid. The Ramachandran plot is something generated from a set of protein structures, an empirical data set. The top graph represents the dihedrals found for all non-glycine residues in a set of structures. You can filter this for proline only, and you'd get the bottom graph. The top cloud of dihedrals represents those found in beta-sheets, and the bottom cloud those for alpha-helices. Sequence (the amino acid before or after) doesn't really matter that much for what's allowed (although we cannot directly deduce this from the data in those graphs). If you look a little bit more into the structure of helices and sheets you'll also find out why that's the case. In beta sheets the sidechain of the +1 residue is pointing completely the other way, and also in helices there's little interaction between the sidechains of subsequent residues. Secondary structures are built using the amides, not with the sidechains. They were originally calculated. This was done by considering the minimum contact distances shown in the diagram (which is from Wikipedia, but based on that in J. Mol. Biol. (1963) 7, 95–99). 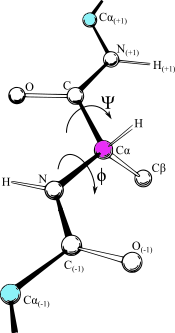 The side-chains were not considered, except for the Cβ of the central residue. In the case of a glycine side-chain that lacks a Cβ, different values are allowed. 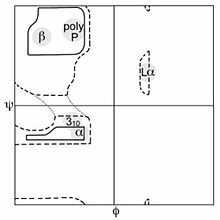 The original plot had ‘allowed’ regions enclosed by a solid line, with an ‘outer limit’ indicated by a broken line. The diagram in Fig. 1 in the question, in contrast, is an experimental plot for amino acid residues (other than glycine) in several proteins. Each point represents the dihedral angles for a single instance of an amino acid. Such plots based on very many amino acids are sometimes used as a check for possible errors in experimental values obtained for new proteins — see review by GJ Kleywegt. The reason Fig. 1 of the question excludes glycine is that its lack of Cβ means it can occur in regions such as Lα, from which most (but not all) larger amino acids are excluded. Likewise, the plot for the imino acid, proline, is different from the other amino acids because of the constraints imposed by the proline ring. Small, non-repeating hydrogen-bonded structural motifs in proteins may also impose constraints on allowed dihedral angles at certain positions in the motif. Such motifs may exert other constraints which influence the amino acids at particular positions. One might possibly regard this as an influence of amino acid side-chain on allowed dihedral angles, although it is perhaps better to regard it as an influence of amino acids on the occurance of the motif as a whole. Not the answer you're looking for? Browse other questions tagged biochemistry proteins biophysics protein-structure or ask your own question.